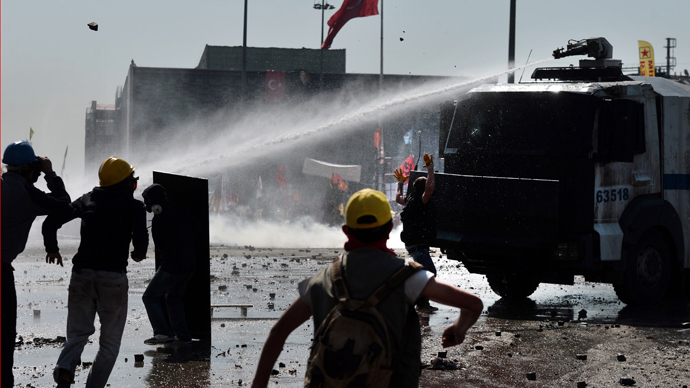 Hundreds of Turkish police clashed with protesters after taking over Taksim Square in Istanbul. The raid allowed removal of barricades and banners. PM Erdogan praised the troops for removing the ‘rags’ as he branded the revolutionary symbols. Read RT's live updates on the Turkish protests. Hundreds of security troops have arrived at the scene early morning. The square itself was mostly empty of protesters at the time. The few protesters present at the square when police arrived were quickly dispersed with tear gas, eyewitnesses report. They retreated to neighboring areas and are launching sporadic assaults at police forces, being beaten back each time. While the square itself saw relatively low level of violence during the first hours of the operation, the surrounding streets have become a place of serious confrontation, RT’s crew reports from the scene. “There are serious clashes in the small streets surrounding the square. They are running after each other tossing stones, bottles and smoke grenades there. It’s a real meat grinder in there,” reports RT’s Ashraf El Sabbagh. At the square, some of the police have dismantled barricades which protesters erected over the days of action. They have also taken down protest banners from the buildings surrounding the square. Others were using water cannons to scatter the protesters trying to retake the square. The activists threw firebombs and fireworks at the armored police trucks. One of the trucks with water cannon mounted on it caught fire after a Molotov cocktail hit it, but another one doused the flame. Hours after police took over the square, a bulldozer arrived and began dismantling barricades which blocked entrances from the nearby streets. RT’s crew was among those who were teargassed at Taksim Square. A camera operator was hurt and his camera was damaged, when a tear gas canister hit the group. Turkish officials told the media they are taking control of the square to protect a monument in it from vandalism. The Monument of the Republic, commemorating the 5th anniversary of the foundation of the Republic of Turkey in 1923 is located in Taksim Square. The monument was covered with some anti-government and pro-revolution graffiti by the protesters. "Our aim is to remove the signs and pictures on Ataturk statue and the Ataturk Cultural Centre. We have no other aim," Istanbul Governor Huseyin Avni Mutlu wrote on Twitter. "Gezi Park and Taksim will not be touched." As the events unfolded at Taksim Square, protesters at the adjacent Gezi Park sought to distance themselves from those involved in the clashes. Some of them tweeted that they never saw the people tossing firebombs at the police in the weeks of the protest. The gathering at the park remained calm, aside from suffering from the effects of tear gas used in Taksim Square. On one occasion several dozen riot police entered the outskirts of the park, but did not make any attempts to take apart tents and shelters or remove any banners and flags before withdrawing. Some people on social media speculate that the morning dispersal was staged by the Turkish authorities to discredit the protest. They say the people tossing Molotov cocktails at police are agents provocateurs, who play along the official depiction of the protesters as riffraff and extremists. Speaking in parliament on Tuesday following the raid on Taksim Square, Turkish Prime Minister Recep Tayyip Erdogan called for national unity. The conciliatory tone of the first part of the speech contrasted the sharp criticism of the protesters and the hardline stance that the Turkish leader demonstrated in the earlier days of the protest. Erdogan’s speech went harsher later, as he went on to separate the peaceful protesters at Gezi Park from the violent “mobs”, whom he blamed of causing public disturbances, damaging property, injuring police officers and scaring off international investors. "95 per cent of the protesters in Taksim did not know" the location of the Gezi Park before the protest started, he claimed. He also lashed out at what he called misinformation spread across the social media and all the way to the reports of the international media. "If my reaction is considered too tough, then I'm sorry. I am Tayyip Erdogan, and I can't change that," the prime minister told MPs from his ruling AKP party. 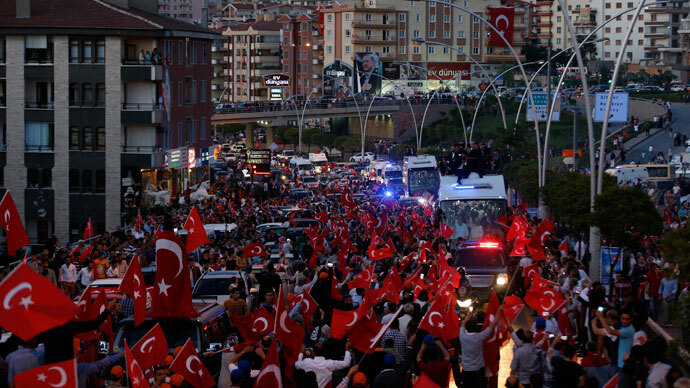 Turkish police were deployed in the iconic square for the first time since retreating from it on June 1. 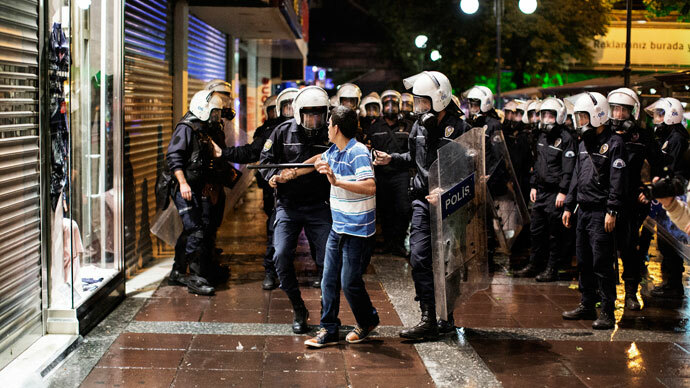 The development follows sporadic night clashes between security forces and rioting protesters in Ankara. 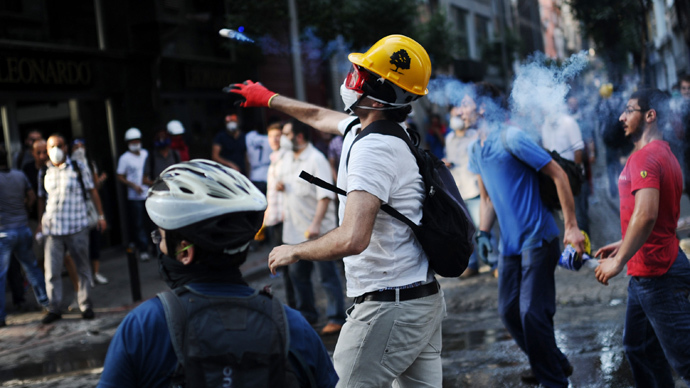 Turkish police used tear gas and water cannons to disperse the crowds. Taksim Square is one of primary locations of anti-government protests in Turkey, which are entering their 11th day on Tuesday. The protests started as a small environmentalist sit-in aimed at stopping a city development project that would see trees cut down at Gezi Park. 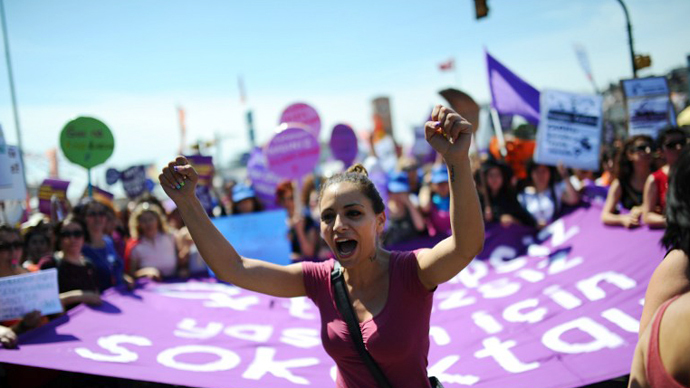 But it grew into a nation-wide anti-government movement following the brutal dispersal of Gezi Park defenders on May 29.